John English Wilber Wild Frankie J Holden and Doug Parkinson all with one aim in mind to entertain excite and get you dancing. My job (Ken Sparkes) is to keep the entertainment flowing and getting the audience involved. We have been planning a Jukebox Saturday night special event but this is far beyond what we had envisaged with this sensational line up. I worked live with Doug Parkinson at the 3 hour Special Olympics TV show back in 2013 and over the years shared many other TV Music shows. Doug is one of our great performers and with his hits repertoire and his ability to sing any song from ballads to rock I always applauded his talent plus he is one of the best loved performers for many decades. It’s also fitting that Wilber Wild is part of Live legends as he was a member of Ol’55 between 1975 and 1997 he is also one of the stars of the Nine Networks “Hey Hey its Saturday”. Imagine the stories Frank and Wilber could tell. I wonder if they will reveal some once the night livens up. What an entertainment package all on the one stage for a special Christmas show only at the amazing new Jupiters show room. All have been rehearsing their Ho Ho Ho’s!!!! 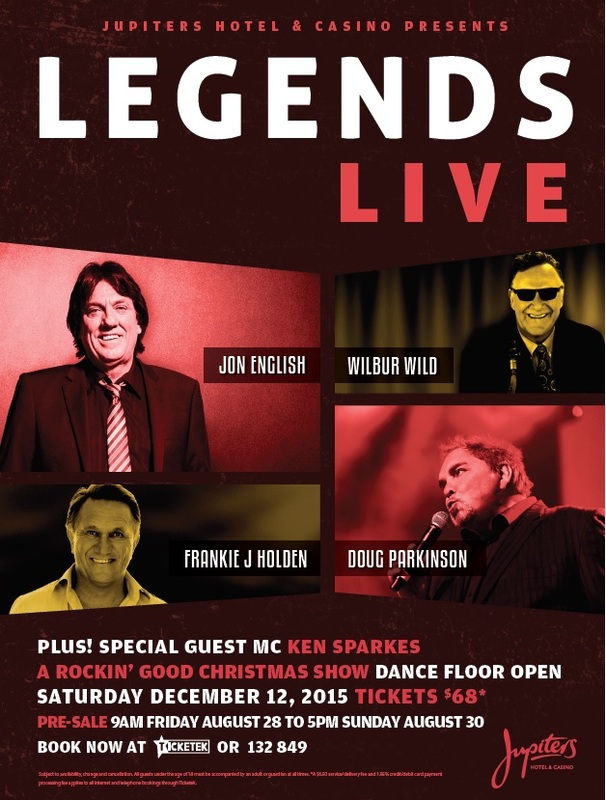 I am truly excited to be part of this show and urge all the JBSNight viewers to celebrate with us a night of Classic Rock music and get into the Christmas spirit, come and join us and remember to meet and greet me , make yourself known December 12th bookings at Ticketek.com.au 132 849 or Jupiters Box Office. Wonder who will dress up as Santa?